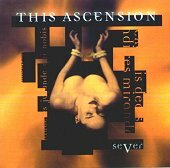 Definitely, the latest CD from This Ascension is their greatest pinnacle to date. The sounds are melodic and refined. It is obvious by listening to "SeVer," that through production and the creative process, that every detail and musical assemblage was tediously put together with an air of perfectionism. All ingredients selectively intertwined exude becalming atmosphere and sincere emotion. This Ascension keeps true to their music and musical style by incorporating various other instruments to accent their creativity. For example, the hammered dulcimer on "I Wish" is an ingenious melt of an instrument long forgotten incorporated in a modern sound. The mandolin is sweeping on "Forever Shaken" and "Dorado" is an epic drum solo, that reinforces how necessary a real flesh and blood drummer is to the overall sound of a band. Dru's angelic voice resonates tenderness and sensuality with every fluctuating pitch. As if it all wasn't enough, the last track "I Wish" tastefully remixed by John A. Rivers, completes the selection by including a beat that anyone can move to.